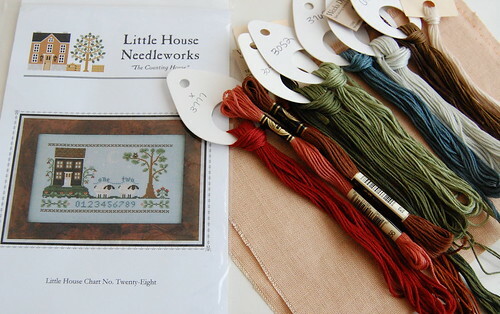 Nicole's Needlework: New Start and New Stash! 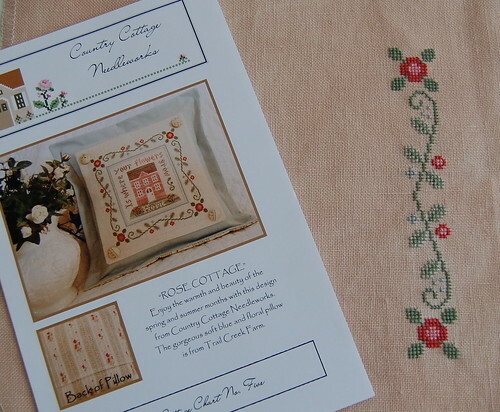 I decided to start "Rose Cottage" by Country Cottage Needleworks. I have always loved this pattern! I'm stitching it on 32 ct. Vintage Light Examplar linen. I switched out the CC Secondhand Rose for GAST Victorian Pink. It matched the darker pink a little better. I'm hoping I have enough because I got another skien at my LNS today and it doesn't match the one I have very well. 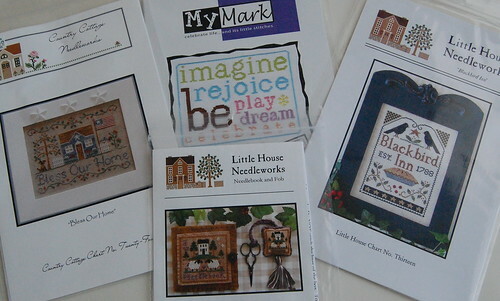 CCN "Bless Our Home," My Mark "Sunshine & Shade," and LHN "Needlebook and Fob" and "Blackbird Inn." 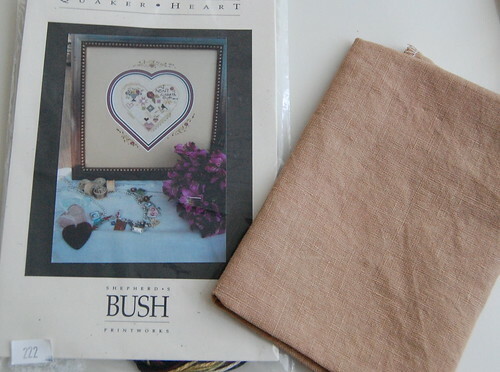 Shepherd's Bush "Quaker Heart" and 40 ct. Fawn Linen. 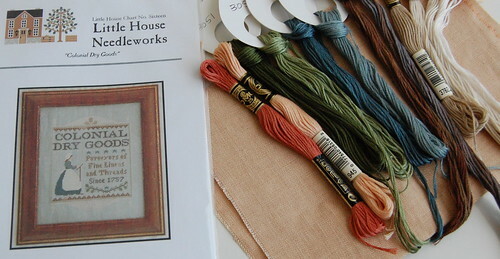 I also decided to tea-dye some Belfast linen I got at Michaels 50% off. I think it turned out ok! Here it is with the threads for "Colonial Dry Goods." I was also thinking of using it for "Counting House." So much fun new stuff for you! And I love your new start!! 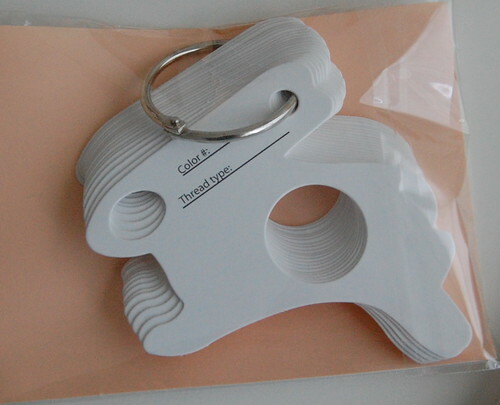 Nicole, could you please tell me any information that you might have on the bunny thread holders that you bought today? My aunt stitches and she loves anything to do with bunnies. Perhaps we could swap email address, because I have tons of stitch related questions to ask you. Well, what a busy little bee you've been! Love seeing stash pics, sort of makes you drool :) Your fabric choices are great and that tea dying has turned out fantastic. Your new start is looking lovely too. Thanks for showing all those pics Nicole. What a wonderful haul you have. I really like the SB chart. You'r tea-dyed fabric looks great! Love your start on Rose Cottage. What a great stash purchase with those cute little bunny thread holders. I like the fabric that you dyed! I think it came out great! Nicole, I'd like to know as well where you got those lovely bunny thread holders from. :) They are so cute!!! Beautiful design: CCN and LHN! Nice stash, Nicole. I love the little bunny thread holders! Very cute. I can see some more finishes in the near future for you! Great new start, and so many wonderful, new goodies!! Lovely new start, Nicole, and all your new stash is gorgeous! Hi Nicole, I am an Italian cross stitcher, kindly could you tell me where can I buy "Bunny Thread Holders". Many compliments for your blog and your works. Luv the Bunny Thread HOlders. What store did you buy them from? I'd love to get some, too. Nicole: I noticed the thread drops you use to kit up your projects & knew they would be perfect for the perle cottons I was using. I bought some of the bunny thread drops @LNS. I really like them!! I am starting out with three pkg. No more 'bends' in fibers!! YAY. I saw the flip-flop ones & the original pkg, too.